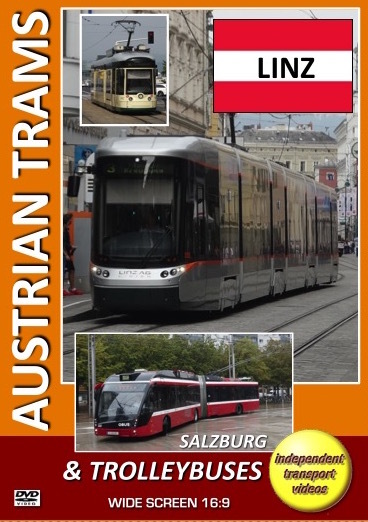 Independent transport videos welcome you to this DVD featuring the trams and trolleybuses in the Austrian cities of Linz and Salzburg. We begin at Linz, an industrial and commercial city in Upper Austria. Electric trams began operating in 1887 and today there are five lines including the Pöstlingbergbahn mountain tramway. They are operated by Linz Linien a division of Linz AG owned by the city and run on an unusual track gauge of 900mm. At the time of filming in September 2016 the tramway fleet consisted of three types of Bombardier trams, the Flexity Outlook Cityrunner, Flexity Outlook Cityrunner II and the Flexity Outlook Mountainrunner. The latter are used on the steep gradient Pöstlingbergbahn line and are painted in a smart cream and dark green livery. Linz Linien also operate the trolleybuses in the city of which there are four routes using a fleet of Volvo/Kiepe 18m articulated vehicles. Our filming begins in Landstraße where we follow the tramlines along this busy street towards Hauptplatz, pausing at the busy crossroads to film the trolleybuses passing through. More filming continues above the river Danube on Nibelungenbrücke as we see the trams heading in and out of the city. We take a ride on the Pöstlingbergbahn line onboard tram 502 on the picturesque journey to Pöstlingberg and returning to Hauptplatz. We now experience a ride on the new Flexity Outlook Cityrunner II trams as we ride out on Line 3 to Meixnerkreuzung on tram 085 and return to Linz Hauptbahnhof on tram 086. At the Hauptbahnhof we briefly film the trolleybuses as they arrive at the station terminus. We now move to the beautiful city of Salzburg, made famous by the film, “The Sound of Music”. Salzburg is the capital of the federal state of Salzburg in Austria, although there are no trams here, there is a large modern fleet of trolleybuses! The system is the largest in Western Europe and is operated by Salzburg AG, with the trolleybuses being branded OBusSLB. Trolleybuses began operating in 1940 and today there are eleven routes. At the time of filming (September 2016) the fleet consisted of ÖAF Graf & Stift/Kiepe, Van Hool NV/Kiepe and Solaris/Cegelec Trollino and Trollino Metrostyle vehicles, the later being the very latest in trolleybus design. Filming begins at the busy Hauptbahnhof terminus where we see all types of trolleybuses in service. We then ride on Trollino Metrostyle number 322 to Makartplatz on route 1. With more filming completed here and at Mirabellplatz we ride similar vehicle, number 314 to Rathaus. We film along the streets in the city centre and then travel to Salzburg Süd onboard 220 an ÖAF Graf & Stift/Kiepe high floor vehicle which still has its ‘conductors seat’ in the rear portion, though no longer used. From the Salzburg Süd terminus we return to Hanuschplatz on a Van Hool NV/Kiepe trolleybus number 287 for comparison. Our cameras now head on back to the Hauptbahnhof to complete our filming, travelling there on trolleybuses 348 via Mirabellplatz on route 4, and then board on trolleybus 236 and later change to 336 on route 1 to our destination. Salzburg is a very beautiful city with commanding views of the mountains. Unfortunately we had rain on our visit but it did not spoil the views of the trolleybuses! We hope you enjoy them.